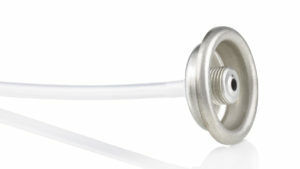 Lindal Group-designed threaded valves, which use the latest technology that are suitable for a wide range of product applications such as DIY automotive refrigerants and camping gas refills, are now available to customers throughout North America, Alex Piagnarelli, North American Sales Director, announced here today. Threaded valves are self-sealing and thus suitable for products wherever screw-on fitments and applicators are a must, for safety and environmental reasons. In fact, the EPA now requires self-sealing valves in all fifty states, on all DIYproducts containing refrigerants. This new product was developed specifically in collaboration with our customers in this market to address these requirements. Currently, Lindal offers two thread options, 8/16-inch and 7/16-inch, which cover many typical end-user products where threaded valves are needed. Such finished products are sold in a variety of mass market channels, including DIY, supermarkets, outdoor outfitters and automotive aftermarket retailers as well as in professional market applications. Lindal Group’s threaded valves have long been available in Europe, where they are renowned as an industry reference for quality and regulatory compliance.